Four stories in one great book about a boy who always gets in trouble. Horrid Henry books appeal to both girls and boys alike and cause tears to roll down your face from laughing so hard. Thanks to the publisher of the Horrid Henry series, Sourcebooks Jabberwocky, I have one copy of Horrid Henry and the Mummy’s Curse to give away. It could be yours! 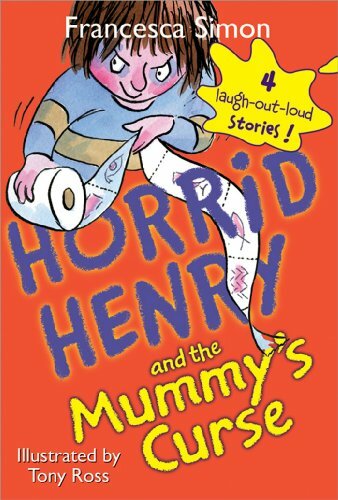 Publisher’s synopsis: Horrid Henry indulges his favorite hobby—collecting Gizmos; has a bad time with his spelling homework; starts a rumor that there’s a shark in the swimming pool; and spooks Perfect Peter with the mummy’s curse. Read our review of the latest books from the Horrid Henry series and then complete this sentence: Warning: These books contain first-rate silliness that may cause fits of laughter and have been known to … . Leave your name and a message in the comments field below, but hold onto your answer. If you are the lucky winner you will be contacted directly via e-mail for the answer. A correct answer must be given to receive your prize. The contest will run October 15, 2009 – October 28, 2009, with the winners being drawn October 29th. Administrator’s computer is the official time keeping device for the Giveaway. Winners will be picked at random using a random sequence generator (your comments are numbered in the order they are received and the numbers are like raffle tickets drawn from a hat). Winners have 72hrs to claim their prize. Unclaimed prizes will be awarded to an alternate winner. Disclaimer: The book will be shipped directly from Sourcebooks Jabberwocky, delivery of the giveaway item lies solely on the sponsor. Names, e-mail address and physical addresses of all winners will be shared with Sourcebooks Jabberwocky for the purpose of fulfillment of the giveaway. Hi Bianca! My son loves Horrid Henry! They are great books especially for reluctant readers as you said. I have the answer. My kids would love it. keep my son up past his bedtime. My son would love reading this with me! Loved checking out the review of the latest books! I know the answer too! Sounds like a great book that would bring oodles of giggles to anyone who reads it!